Review of cease and desist and restoration orders served on client. Review of aerial photography and farming history. Documentation of historical drainage systems. Preparation of report characterizing farming history, wetland types and justifying a drainage exemption. 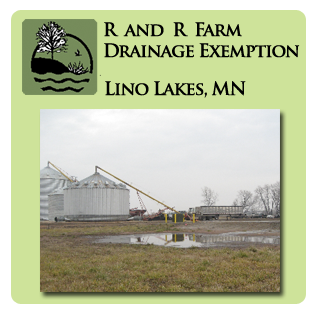 R and R Farms completed drain tile maintenance activities on an 80-acre farm in Lino Lakes, Minnesota in the fall of 1999. In reaction to these activities, the DNR Enforcement Officer served a cease and Desist Order, claiming that the project was not exempt and that R and R Farms either had to disable the repairs or replace 22.9 acres of wetland potentially affected. KES completed a review of aerial photography to document farming history of the parcel and determine wetland types potentially affected. Based on that review, it was determined that 21.1 acres of wetland was Type 1 or 2 and was therefore exempt under the WCA Drainage Exemption. The remaining 1.8 acres were Type 3 and would require replacement. The exemption application was submitted to the LGU and COE on behalf of R and R Farms. Two TEP meetings, including a site visit and an in-office review of aerial photography were completed to evaluate KES conclusions and the drainage exemption application. The TEP and COE concurred with KES findings and approved an exemption for the 21.1 acres of wetland. The remaining 1.8 acres impacted were considered non-exempt. A replacement plan was prepared and submitted to the LGU and COE. It was subsequently approved by both agencies and the cease and desist and restoration orders were rescinded in 2001.